A robust Western, El Dorado gallops on familiar grounds but does so with veteran respect. Gun-for-hire Cole Thornton (John Wayne) has a long friendly rivalry with El Dorado's Sheriff J.P. Harrah (Robert Mitchum). Not wanting to tangle with J.P., Cole turns down a job offer from greedy businessman Bart Jason (Ed Asner) to drive peaceful landowner Kevin MacDonald (R.G. Armstrong) and his family off their water-rich land. But in self defence, Cole kills one of MacDonald's sons and is then himself shot and wounded by MacDonald's daughter Josephine (Michele Carey). On a trip away from El Dorado, Cole strikes up a friendship with young Mississippi (James Caan), an expert knifesman who spent two years avenging his friend's death. Cole also runs across notorious gunslinger Nelse McLeod (Christopher George) and his gang. Cole and Mississippi return to town and find J.P. a full-fledged drunk, having been dumped by a woman. Cole has to dry out J.P., and along with help from Mississippi and old timer Bull (Arthur Hunnicutt), they face-off against McLeod and his men, who have now been hired by Jason to finish off the MacDonalds. 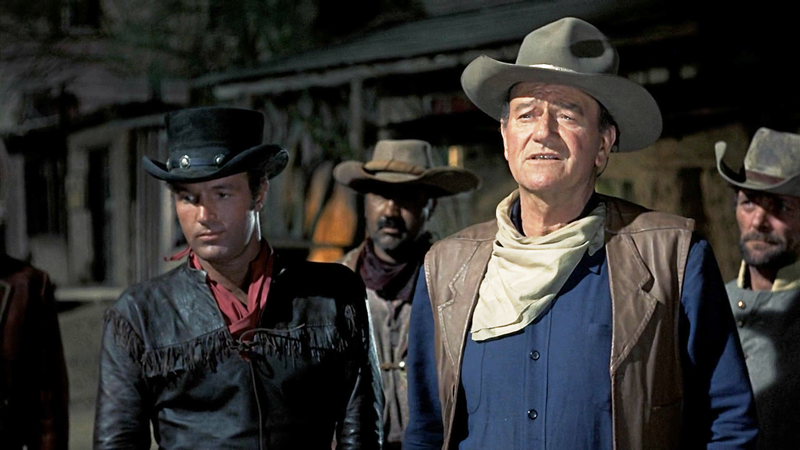 The penultimate film directed by veteran Howard Hawks, El Dorado is an almost straightforward retelling of Rio Bravo. Hawks and Wayne recreate every essential element with just a few new shadings, and deliver a surprisingly enjoyable and polished experience. Particularly in its later scenes, El Dorado injects elements of humour, mainly of the self-deprecating poke-fun-at-the- elderly-walking-wounded kind, and does open up the locations to include more incidents away from the town. The film is almost from another era, and that's a good thing. By this stage in the 1960s many Wayne movies were becoming parodies of the man and the image, overly reliant on slapstick and lowest common denominator, feed-the-fans-what they-want fodder. El Dorado strikes a mostly earnest tone, giving the story enough respect to anchor the narrative and celebrate traditional western staples of friendship, loyalty, and doing what is right despite the risk of harm. The film is enhanced by the grey moral zone occupied by Cole Thornton. His flaws come to the fore early, from his profession as a gun for hire, to killing MacDonald's son, and then falling victim to Joey's ambush. Meanwhile the action scenes come at regular intervals but are only as long as they need to be, punctuation marks enhancing rather than sapping the strength of the story. 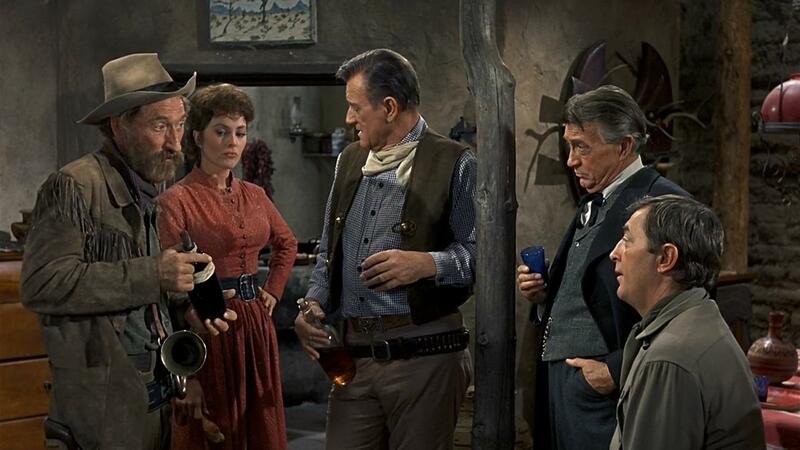 Helping El Dorado stand up to the long shadows of classic westerns is a terrific cast surrounding John Wayne. Robert Mitchum as J.P. Harrah takes on the Dean Martin role and makes it his own, Mitchum shedding most of his usual lackadaisical mannerisms and appearing much more engaged than usual. A young James Caan shines in the role of Mississippi, and is a notable upgrade on Ricky Nelson. Catherine Holt creates the role of Maudie, a more subdued long-term romantic interest for Cole, while Michele Carey provides the female firepower, literally, as the shotgun-toting Joey MacDonald. The depth of talent continues. Christopher George as dangerous gun-for-hire Nelse McLeod comes with plenty of confident menace, while Arthur Hunnicutt, R G. Armstrong and Ed Asner provide plenty of grizzled veteran presence. El Dorado is a welcome echo from the past, a good story deserving of a second telling, any lack of novelty overcome by the traditional strength of material.